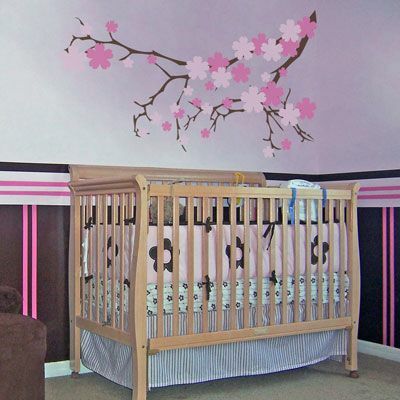 This flowering cherry blossom branch wall decal looks like it's growing right out of the corner! It is shown here in matte dark brown with matte pale pink and matte soft pink blossoms and is ideal for your baby's nursery! It's also great for offices, bathrooms or just about anywhere you can imagine. This cherry blossom wall decal measures 60" wide by 34" high and is available in the three colors of your choice! I bought the birds to place on my new baby daughter's walls to make her room a bit custom. In the past three months of her life everytime she gets her diaper changed or lays in her crib she stares at those birds. She LOVES them, now that she is starting to "talk" she coos at them. Its so cute!! I recommend them to any parent. Recently upgraded the bathroom. Using 2 of asian papercut design in an alcove where the commode is, 2 of wild grass in a lt brown matte finish over painted coffee-colored walls above molding, alongside a large garden tub. The result is subtle. It looks like the design is painted on! My decal was so much more amazing than I thought it would be. So easy to put up, as the instructions were well-written. Decal was large and makes a great statement in my living room.